It's easy to get lost within the dreary world of The Killing, whether it's because of your fascination with the characters, the infamous case they surround or the fact that sometimes you can't understand why everyone looks like they've pressed their somber faces against a rain-soaked window and have been listening to Sarah McLachlan on repeat. The show has maintained its consistency in its serious tone and season two is clearly pushing a focus towards its characters and their unraveling and/or dealing with the dramatic bumps in the road. Yes, the Rosie Larsen case is still the primary focus, but there's been a stronger attempt at shining some light on the stone-faced denizens of Seattle. And while last week's episode seemed to shove that aspect in our faces - but left me feeling more tired and bored - this week's "Ogi Jun" gave us smaller doses while involving some real detective work. And no Mitch. Linden and Holder are back together, which is a good thing because I enjoy their pairing and their drastically different personalities, along with their determination to get the job done even with their troubled personal lives. While Linden's inability to have stability for her son or find a better way to give him some parental attention is going to be a future problem, it merely made her just a bit more frustrated and cold than she normally acts. She cares for her son, but it will be interesting to see if her priorities change with her husband's suing for custody. For now, she's still out to catch the killer and I appreciated getting some much needed movement on that particular front. At the very least, there's a feeling that Linden and Holder are questioning multiple subjects and gathering evidence before jumping to conclusions again. I know the pacing is much slower than if you're watching CSI or something that is one and done by the end of the episode, but because it was mixed with the character situations and actually connecting the clues, it didn't feel like it was dragging along like last week's episode. Even the revelation that the boy with the Ogi Jun tattoo was the son of the man that Stan Larsen killed to free himself from working with Janek took the show for a little spin. Does that mean that Rosie's death was a revenge killing? The drawing discovered at the end (with her face crossed off) would certainly cause us to think in that direction - but I've got a feeling that the boy was infatuated with Rosie because he liked her and therefore sketched her. I'm guessing at some point Rosie rejected him and he got angry leading him to ruin his portrait. There's something more at work here. 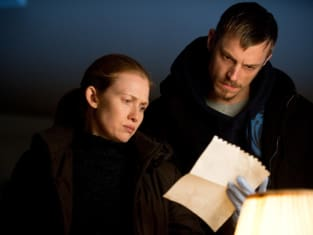 If anything, I'm glad that Linden and Holder merely took the evidence to deepen their investigation and possible connection to Janek rather than outwardly thinking the boy with the tattoo had to be the killer. I even liked that Stan was able to discover on his own that Janek might be more connected to his daughter's death than he thought. Despite Janek questioning Stan's manhood, Stan has definitely been taking matters into his own hands. He's been far more proactive than just sitting on the sidelines. And even despite not really enjoying the scenes with the kids, Stan telling Tommy to fight instead of run away was a pleasant surprise. Sure, it can be seen as a questionable statement, but sometimes you have to stand up for yourself rather than ignore the problem and it mirrored Stan's own situation. Richmond really doesn't want to stand up for himself anymore and has progressed to his angry phase of shutting the world out. I can't imagine not being able to walk anymore; his own frustrations must be tearing him down. I'm curious as to what makes Jamie take such a personal interest in the man. Does he stick around out of loyalty, obligation or because no one else would show up for Richmond? His role has certainly changed from the political shark to the caring human being (Gwen turned icy cold, didn't she?) and in a way I find watching him attempt to deal with the unfortunate circumstances better than just Richmond's struggle. Jamie has a heart when he doesn't necessarily have to have one for Richmond. I know the show has a long way to go before revealing Rosie's killer and that's fine with me. It really is. I just hope that it will continue to find clues and make logical choices in its direction rather blatantly misleading for the sake of a shocking discovery. There's still something to be said for this show and, despite certain aspects that can be grating or frustrating, the atmosphere of The Killing is certainly a change from other programs. The world isn't so cookie cutter perfect and as long as the rest of the season maintains balance and avoids cliches, the bigger mystery will hopefully be a satisfying payoff. Hopefully. Are you enjoying The Killing? Have you given up? Sound off below!